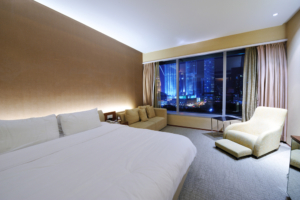 Hospitality Lighting: Are Your Lights too Gloomy? 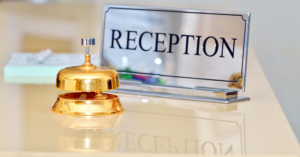 Hospitality professionals know every little touch counts. When deciding on decor and architecture, don’t overlook lighting. The proper lighting can enhance the rest of energy and effort you put into making your restaurant or hotel look its best. You’re more likely to be in a better mood when the sun is shining. The same is true of stepping into an environment that’s well lit. Specifically, it’s the hue of the light that alters a person’s mood for better or worse. LEDs provide better color consistency when compared to traditional incandescent lights. Incandescents cast a tainted yellow hue that does not resemble natural sunlight. Yellow, dispersed lighting does nothing for the mood in this room. The variety and placement offer day and night mood setting options. You may consider colored LEDs. You often see these effects at bars or nightclubs, but subtle accent colors can enhance the atmosphere at your restaurant or hotel as well. Blue light is great for daytime hours, but it can cause guests to feel depressed during the night. With that in mind, consider having two light color schemes for the interior of your business with a cool day mood as well as a warmer night mood. Restaurant owners should aim to create an ambiance for each table. The high color representation of LEDs allows guests to see dishes in true colors, which makes them more appetizing. 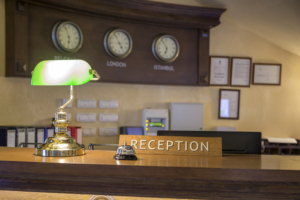 For hotels, it’s best to aim for hospitality lighting that’s welcoming and cheerful. A bright, clean look sets guests up for a better experience than a poorly-lit and gloomy reception area. Rooms should offer enough light that guests can easily read in bed or use the vanity. Guests should be able to clearly see themselves in the mirror. A poorly-lit reception area makes this space look outdated. Bright lighting brings out a cleanly appearance. 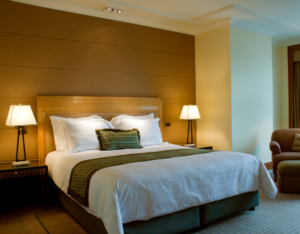 Additionally, hotel owners should also consider giving guests the option of controlling the light intensity by installing light dimmers in every room. Such small touches are sure to be appreciated and improve guest satisfaction. LED upgrades don’t have to be a daunting expense. Our experts at NCLED will perform a property audit and walk you through how LEDs actually save you money on energy expenses. Change the way guests see your business by changing the lighting. Learn more about why LED is great for your building by calling us at (920) 455-8338.